Here’s how it works. You give the developer your UDID (unique device identifier) and they can compile a zip file of their app with your ID. It will only run on your iPhone. 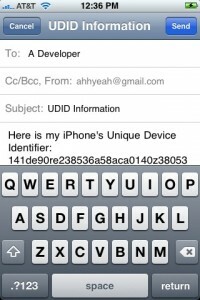 To get your UDID, Erica Sadun made a sweet little app that when ran, opens an email with your UDID and ready to send to the developer, you just need to add their email address. Once the developer send you the app you can just drag it in to the applications section of your iTunes. Developers can do this to up to 100 iPhones. I’m not sure if this is per app or for all apps. We tried this with the developer of Garf. Remember that game? The one like Simon? 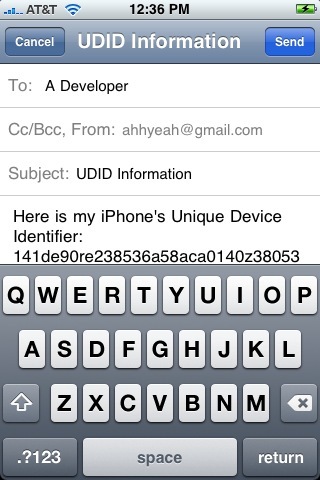 The developer sent me the app zipped up with a Mobile Provision file, AdHocJLA.mobileprovision. I tried dragging them both into iTunes and the app did show up in applications although it didn’t have the icon, it just had a generic App Store icon. I ran the sync on my iPhone/iTunes (took forever) and IT WORKS! The app installed fine and I got to play and test it out! If you’re looking for applications to be tested or reviewed you can get a hold of us via our Contact Page and we’ll send you our UDID. Click here to download AdHoc via the App Store. where do you get developers emails??? if you are going to test apps, and they are going to charge in the apple store…. they should accomidate you. I mean you are running the risk of a buggy app on your phone, and you are providing a service so to speak. What will stop a ‘false developer’ from sending you or us some dangerous code. If it’s not released in the App Store, Apple hasn’t approved it, right? there are plenty of people willing to beta test apps for free. it’s not hard to find testers…the testers feel more like they are the ones being offered something. and if a developer purposely sends you something purposefully malicious, well you always have the provisioning file that you can forward on to apple which should allow them to track them down. it’s definitely traceable back to the registered (and paid) developer. where did you find the garf developer email? I want to try out garf for 2.0! I asked you and Brook to give me your UDIDs two weeks ago, so you can have latest versions of our products two weeks ahead of app store approval. Please mail me to support@caissa.us. We have no nonsence applications in our portfolio and compete with big boys.